Move over, coloring books! Here’s an entirely new craft that kids will love: Paint by Sticker Kids. 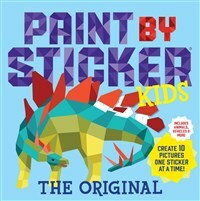 It is the same compelling craft first introduced in Paint by Sticker, but just for kids! The book includes everything you need to create 10 bright, playful, full-color illustrations—illustrated templates printed on perforated card stock, and 10 pages of stickers to fill in and create the artwork. The fun, vibrant images are rendered in “low-poly,” a computer graphics style using geometric polygon shapes to create a 3-D effect. As in paint-by-number, each template is divided into hundreds of spaces, each with a number that corresponds to a particular sticker. Find the sticker, peel it, and place it in the right space. Add the next, and the next, and the next and voila!It’s a rocket ship blasting through space. A Tyrannosaurus rex prowling his domain. A pickup truck hauling its load. A friendly toucan hanging on his perch. Kids will love watching these pictures come to life.